There was also one in QLD, I can't remember much about this SA one, I think it was a small town. "(Saturday, January 10, 2004) - A 6-year-old girl suffered serious head injuries when she was thrown from a Sizzler ride at Pratten Park in Broadbeach, Australia. Police and Workplace Health and Safety inspectors investigating the accident believe that the girl put her feet up on the seat of the ride and folded her legs, leaving her unrestrained by the ride's metal safety bar. The ride operator shouted at the girl and pressed the stop button when he realized that she had moved, but the girl was thrown from her seat and hit her head on the ride's metal frame. She was hospitalized in critical but stable condition. 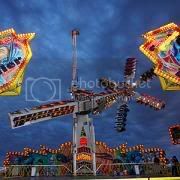 The ride was found to be in safe operating condition." I will try and dig some information up about the 2000 incident.